Why is Vicente Fox calmly making his progress through the western section of the United States, "promoting trade," lecturing the Congress on immigration, fairness, and the need work together to "solve the problem"? 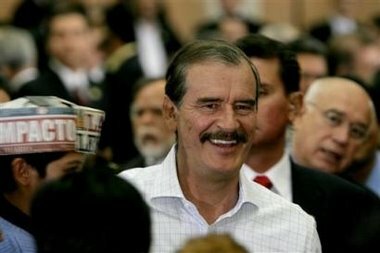 Unperturbed, he knows that he probably has nothing to worry about, that there is little risk of being thwarted, of the border being sealed, of Mexican remitters being branded felons or, really any meaningful change and the partnership, the done deal has already been arranged, in conferences, behind the scenes, out of view of the American people. Without announcing his intentions to do so, President Bush has decided to support the creation of a North American Union through a process of governmental regulations, never having to bring the issue before the American people for a clear referendum or vote. The Bush Administration has decided to "back-door" the creation of a North American Union political entity that would effectively erase our borders with Mexico and Canada and create several super-regional governing bodies that would have jurisdiction over the U.S. Congress and the U.S. Supreme Court. Contrary to NAFTA, whose tenets were laid out in a single negotiated treaty subjected to at least cursory review by the legislatures of the participating countries, NAFTA Plus is more the elites’ shared vision of what a merged future will look like. Their ideas are being implemented through the signing of "regulations," not subject to citizens' review. The vision may initially have been labeled NAFTA Plus, but the name gives a mistaken impression of what is at hand, since there will be no single treaty text, no unique label to facilitate keeping tabs. Perhaps for this reason, some civil society groups are calling the phenomenon by another name, the Security and Prosperity Partnership of North America (SPPNA), an official sobriquet for the summits held by the three chief executives to agree on the future of "North America." We have previously discussed the March 2005 summit in Waco, Tex., where President Bush, President Fox and Canadian Prime Minister Martin made their joint statement announcing the formation of "The Security and Prosperity Partnership of North America" (SPP). The Department of Commerce documents the extensive working agenda undertaken by the U.S. government to implement the SPP directive. After initially rejecting it, the idea of a "North American community" has come of age among U.S. government strategists and a convinced George W. Bush is now vigorously pushing it forward. We have also pointed to the Council on Foreign Relations' (CFR) task force report entitled "Building a North American Community" that contains the blueprint for creating a North American Union by 2010. The CFR task force report makes clear that a fundamental goal of the contemplated North American Union would be to redefine boundaries such that the primary immigration control will be around the three countries of the North American Union, not between the three countries. Packard argues that a driving reason Bush has embraced the idea of creating the North American Union is to secure natural resources -- Canadian water as well as oil and natural from both Canada and Mexico. Regarding water, Packard notes that "Bush declared that Canada’s water was part of the United States' energy security." As evidence, he cites "mega-projects" proposed by the U.S., such as a "Grand Canal" that would transport "plentiful water from Canadian rivers and lakes to the Great Lakes." Regarding oil and natural gas, Packard comments that a North American Union would "guarantee a relatively cheap flow of oil," making the idea of creating a single North American space suddenly "not so ludicrous." Packard documents the extensive work the CFR independent task force (ITF) took to create their blueprint report. ITF had three meetings, in Toronto (October 2004), New York (December 2004), and Monterrey (February 2005), before releasing their final report (May 2005), just after the Waco trilateral meeting. A key adviser to ITF was Robert Pastor, director of the Center for North American Studies at American University. Even though Pastor supported John Kerry for President in 2004, he ends up having a major impact on Bush as the current administration moves forward to implement the CFR plan to form a North American Union. Even before joining the ITF as vice chair, Pastor was preaching the need for the North American Union to have a political agenda. In a speech titled "A Modest Proposal" in snide homage to Jonathan Swift, Pastor told the Trilateral Commission in 2002 that the North American Union needed to implement a series of political proposals which would have authority over the sovereignty of the United States, Canada and Mexico. Specifically, Pastor called for the creation of North American passports and a North American Customs and Immigrations, which would have authority over U.S. Immigration and Customs Enforcement (ICE) within the Department of Homeland Security. A North American Parliamentary Group would oversee the U.S. Congress. A Permanent Court on Trade and Investment would resolve disputes within NAFTA, exerting final authority over the judgments of the U.S. Supreme Court. A North American Commission would "develop an integrated continental plan for transportation and infrastructure." Pastor also advocated the creation of a new currency, the "Amero," to replace the U.S. dollar, the Canadian dollar and the Mexican peso, much as the Euro replaced the currencies of the individual participating countries. The creation of the Amero had first been proposed by economist Herbert Grubel in a 1999 report to the Canadian Fraser Institute calling for a North American Monetary Union." Bush's determination to press for a North American Union may well be a key reason the Bush Administration has not secured our border with Mexico. Since 1986, important law enforcement provisions of our various immigration laws have been largely ignored, while "amnesty" provisions have grandfathered millions of illegal aliens to stay and gain citizenship. The Bush Administration has supported adding enforcement to the Kennedy-McCain bill (S. 2611) currently being debated in the Senate. Are provisions to build a 370-mile wall and to send the National Guard to the border being added merely to look tough, with the real goal being to legalize the 12 million illegal aliens the administration admits are already in the country? Conservatives in the Senate and the House must demand be answers before final votes are taken and a conference committee sets to work. What is your goal, Mr. President, to establish a North American Union where the border with Mexico is erased, or to secure the border once and for all, such that the invasion of Mexico's underclass into America stops? I didn't vote for this? Did you? Why hasn't this been reported on the front page of every newspaper in America? The Bush and Fox "good cop, bad cop routine" has gone on long enough. The sad part is that most of Congress probably is also complicit. Everyone has been informed that the Senate bill won't meet muster in the House and the whole process will shut grind down. Part of the wall will be built, 1,500 Border Patrol agents can be trained yearly and put into place, the National Guard is there to "assist", but nothing more. Illegal "foreigners" will trickle in or pour in with no barrier to stop them and, eventually, there will be so many here that "Nafta Plus" will seem natural and the merger will be complete. And yet they come, using any route possible.